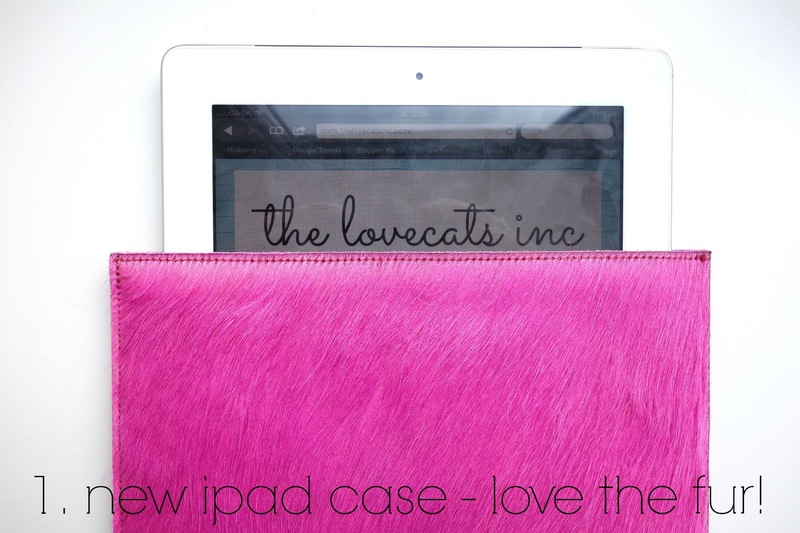 pink fur ipad case from not on the high street* | i’ve been using my ipad more and more these days, as my laptop (or space station, as my boyfriend calls is) is too heavy to take out with my all the time. this real leather ipad case has been saving my gadget from being scratched plus the colour is pretty darn amazing. my ipad is one with 3G and, when i’m not at home/connected to wifi, i do use it quite a lot. i’m thinking of changing my phone contract to a deal from the likes of dial-a-phone.co.uk as it gets pretty pricey when you’re using your bits of technology as much as i do. i’ve consistently had ‘you’re close to your date usage’ texts in the past few months and it’s getting like that with my ipad recently! i’ll have to do some research. 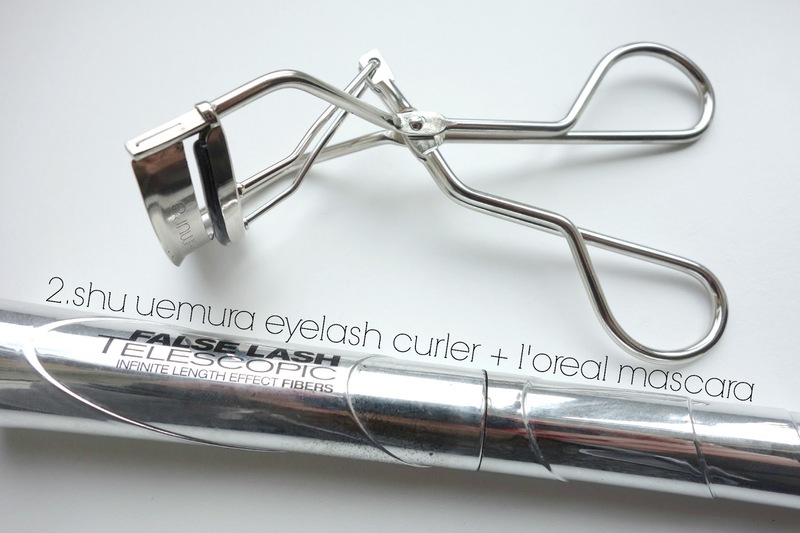 shu uemura eyelash curler and l’oreal false lash telescopic mascara | i put off buying this eyelash curler for a hell of a long time as i just didn’t get how it could be better than all the others i’ve tried. …as they’ve all done nothing for me. but, this thing actually blows my tiny mind. it’s amazing! i know the shu uemura eyelash curler is expensive but it’s honestly worth every penny for how open it makes your eyes look and how well curls your lashes. topping this off with l’oreal false lash telescopic mascara makes for some lovely, separated yet thick lashes. 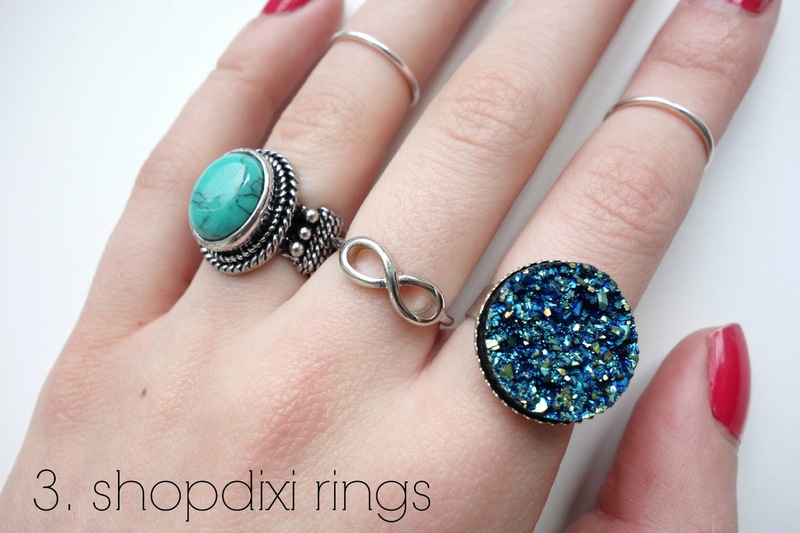 shopdixi rings* | it’s no secret that i’m a fan of shopdixi. my collection of rings is becoming quite extensive and a good 90% of them are from that lovely online store. they’re just all so pretty and it’s nice to have something a bit more unique than your standard topshop number. i’d definitely recommend checking them out. 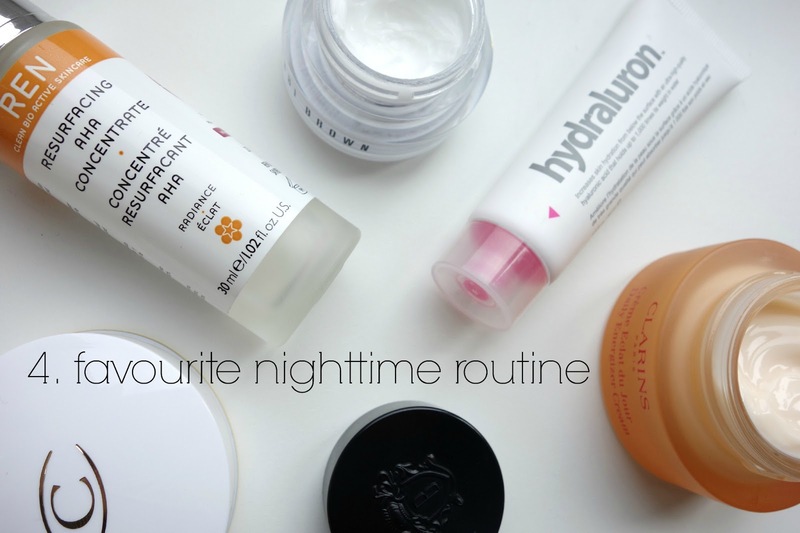 favourite nighttime combo | for some reason my skin seems to have adapted to liquid gold, despite only using it about once or week, and i’m not seeing the difference like i used to. so, i’ve decided to switch it up with REN’s AHA treatment, as i feel more comfortable using a moisturiser over the top and i’ve been really liking the results. REN’s resurfacing AHA concentrate | as mentioned above, like liquid gold, it’s an exfoliator that works overnight to buff away dead skin cells to leave your skin looking bright, clear and refreshed. i do love this one as it doesn’t smell or feel as strong or chemically as the LG! hydraluron serum | i think this has reached cult status in blog world and for good reason. when i ran out of this i noticed a huge difference in my skin, as it was a lot drier and just didn’t look as nice. now it’s back, my moisturiser seems to work better and my skin looks a lot plumper. bobbi brown hydrating eye cream | i’ve been using this for about a month now and i think it’s really love for both day and nighttime use. it sinks in well and keeps the eye area feeling soft and hydrated. clarins daily energising moisturiser | a new purchase after reading kate’s blog. i love this moisturiser! it feels really thick, which i thought might be a bit much for my combo skin, but it’s not a problem at all. it makes my skin feel so smooth, i adore it. 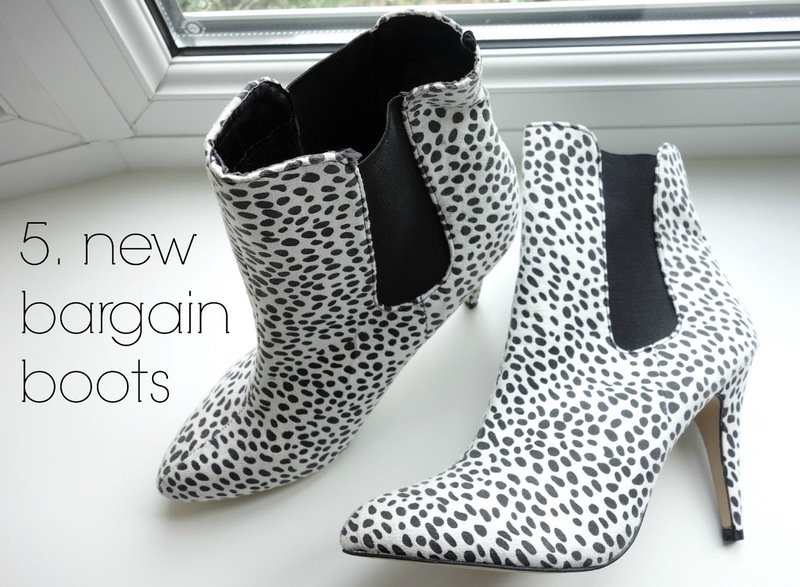 new boots | are they tacky? yes. do i completely adore them? the fact that i’m currently wearing them answers that question. they’re unbelievably comfortable, look great with neutral outfits and were, wait for it, only £3. oh primark, you are wonderful sometimes. ps. check out these lovely blogs: hello freckles and terriface!